Solar Powered Spot and Flag Lights are ideal for adding a practical yet elegant glow to your garden, flowerbed, deck, patio, or any other feature in your landscape. Solar Spot and Flag Lights are available in a number of different styles, and they offer a variety of light color options. There are Solar Powered Spot and Flag Lighting options to suit all tastes and budgets. You are sure to find just the spot light or flag light that you are looking for. The Solar Powered Spot and Flag Lighting category contains Solar Spot Lights, Solar Flag Lights, and Solar Post Top Lights. Solar Spot and Flag Lights are available in a variety of styles. These lights are available in a number of price options, as well, making them great for any budget. There are also more than 20 different fixtures available, so you are sure to find a light to serve all of your practical purposes. 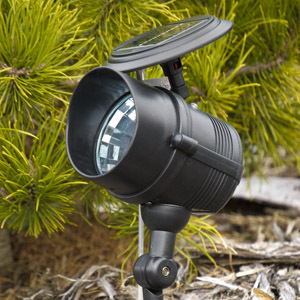 In addition to traditional solar spot and flag lights, there are also solar post top lights, and spot lights that look exactly like rocks, which are designed to fit into your landscape without being noticeable. These solar spot lights are thoroughly tested to ensure output, and are among the brightest solar lighting options available. These lights are ideal for illuminating landscape features such as plants, rock gardens, statues or fountains. Looking to accentuate your favorite landscape features? Perhaps you’d like to illuminate a large billboard? Whatever size job you may have, there is a Solar Spot lighting option to accommodate your needs. If you are in search of a way to accentuate a flag or banner, even after the sun has set, without harming the environment or adding to your electric bill, look no further than Solar Powered Flag lights. During the day, these lights charge themselves with the available sunlight. When it gets dark, these lights automatically turn on, and then turn back off automatically when the sun comes back up. Since solar energy products such as these do not require traditional electricity, they will cost you nothing to use. Solar Flag Lights are a great way to highlight a flag or banner after the sun has set. Solar Flag lights harness the energy of the sun to charge during the day, then, when it gets dark, the light will automatically turn itself on and shine well into the night. Because the power of the sun is a clean and renewable resource, they will not harm the environment. Because they do not utilize traditional electricity, they will not add to your utility bills. Solar Post Lights are ideal for the tops of fence posts. They work very well for ling you perimeter fence, your deck railing, or your exterior stair banister. These lights are available in a wide range of finishes, styles and sizes. Each model has its own unique style. This variety means that Solar Post Top lights can accommodate just about anyone’s tastes and are priced reasonably to be available on any budget. When utilized to illuminate exterior steps or stairs, these lights can help prevent perilous trips and falls. Solar Post Lights can be easily placed atop fence or decking posts. Interested in learning more? Check out our Solar Flag & Spot Lights here.